Syriza MP Costas Lapavitsas on what's next for Greece after Sunday's resounding vote against austerity. 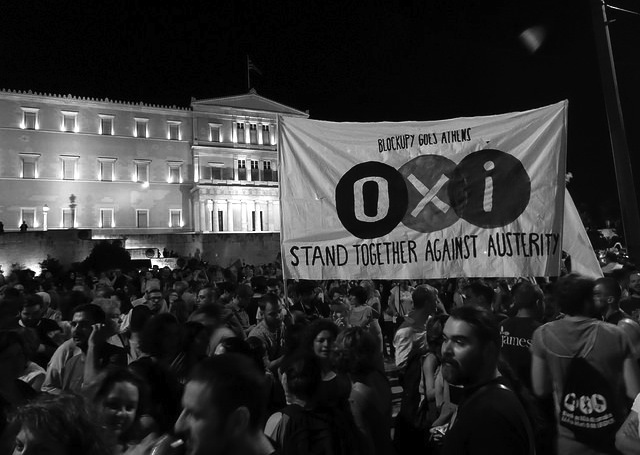 The Greek people’s rejection of austerity in Sunday’s referendum was an enormous victory. But what’s next? How will the ongoing crisis be resolved? And is a Greek exit from the eurozone inevitable if ending austerity is the aim? Yesterday our friends at the Real News Network interviewed Costas Lapavitsas, a radical economist and a Greek member of parliament, about Syriza’s options going forward. Also a member of Syriza’s Left Platform, Lapavitsas has long been skeptical of the party leadership’s negotiating strategy and the viability of remaining in the eurozone. Here he discusses Yanis Varoufakis’s resignation as finance minister, the oligarchic private media, and the necessity of bank nationalization. Syriza MP Costas Lapavitsas on what’s next for Greece after Sunday’s resounding vote against austerity.